Whether we are making a presentation to our board of directors, meeting with our sponsor or conducting a status meeting with our team, using the tell-show-do-practice-review model helps us engage our audience, deliver our message and help our audience retain the information. Merely telling the audience is not enough; we must engage as many of the senses as we can. Simply adding some visual aids improves the retention of our message. If we can get the audience to actively participate in the learning and put the concepts into practice, we further improve retention. We are bombarded with continuous information, we retain 10% of what we read, 20% of what we hear, 30% of what we see (visual images), 50% of what we see and hear simultaneously, 70% of what we say, 90% of what we do and 95% of what we teach (CSUN, 2011) . If we want to learn or we want others to learn, we must do or have them do. As learners, we must see the process as interactive. If we do not understand, we ask questions, ask for examples, rephrase what we have learned. We must practice what we have learned. When we communicate, regardless of forum, we are educating and we have a responsibility to ourselves, our message and our audience to make it as easy to understand and retain as possible. Telling starts the process, but we must bring it home by showing, doing, practicing and reviewing. These principles lie behind the peer 2 peer work I have been working on with schools so that they network to help school headteachers (principals) have a deeper understanding of their own school. Jon, Thanks for your comments. 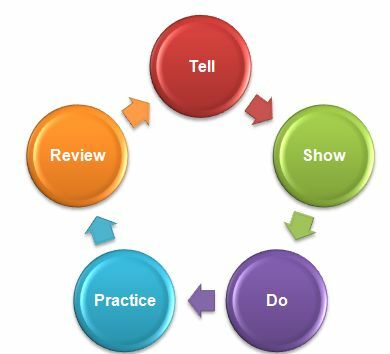 I see so many potential applications for the tell-show-do-practice-review model. If we think about what “take-aways” we want our audience to have from our communications, we tend to be more focused on streamlining the message. By increasing the level of engagement of our communications, we increase the likelihood that our message will reach the intended audience resulting in the intended action(s). Another technique to help “increase signal, reduce noise”.